I often get asked why my logo design process seems to differ from many other freelance logo designers. I don’t take your money, scurry away for a week then present you with 4 gleaming logo design ideas for you to choose from. You choose one, offer up some remarks then I scurry away again and make several rounds of alterations and changes. After a few days, I come back to you with a more complete logo. Then possibly a few more changes before completing the project. Finally, hoping to get paid. This seems to be a common approach for many logo designers I know. There is a set cost, set number of ideas and revisions and possibly some extras thrown in like basic stationery designs, letterhead, business cards etc. This process is solid and it works for many clients, so this is not a criticism of this approach. I am outlining my own approach and how it differs from the above and how it might, for some clients, be a more interesting and enlightening approach. I was hoping to get the whole process in one post, but as usual, my inability to keep it short and sweet has lead me to section the idea. Rather than offer a quick overview, I have gone into excruciating detail on each significant part of the process. So this first part focuses on the first contact, when a client approaches me with a view to hire me for their logo design needs. I hope it offers some insight into how I work and might offer some ideas for you to implement yourself. I place a lot of importance on communications at the beginning of a project, way before any money has parted hands and long before I even know the project is secured. I usually first find out about a possible job through a potential client filling in one of two online quote forms, or mini brief. A set of questions designed to get the client to think about what they need and for me to get a solid understanding of their requirements. I use Google Docs for my online quote form, it’s not the prettiest but works well. As the quote form is quite long, I do suggest that clients can call first. This might be useful if they need some help with aspects of the logo design process, rather than sit down filling in a heap of questions. If the filling in the form is the only option available, if might very well put them off contacting me. So I encourage them to contact me in whatever way they feel comfortable with, then we can take it from there. Even though this is the usual first contact, I do encourage people to call me first. Nothing can substitute actually hearing about a project, listening to the hopeful new client explain their business. It is easier to offer thoughts, suggestions and advice. A deeper level of understanding can be gleaned from a call than filling in the quote form, so this is my preference. 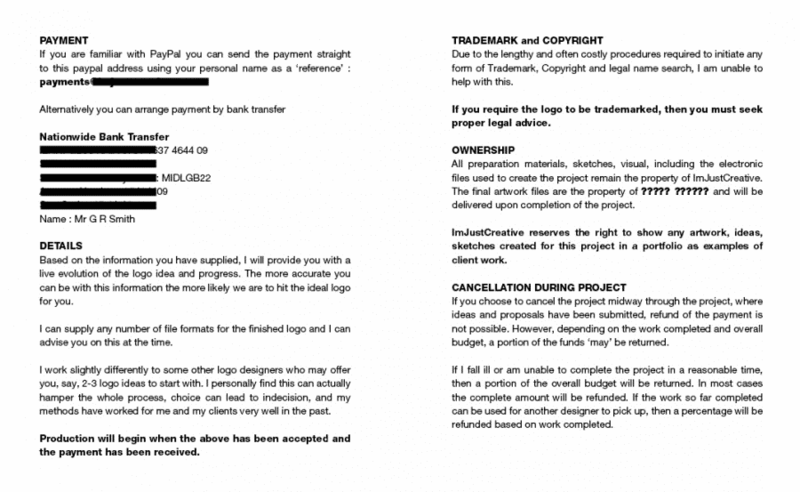 I know of some logo designers who prefer to deal with clients only via online methods, not the telephone. There are some projects where a decent chat is essential, especially if you are working on a personal brand. You need to hear the voice, find out about their personality and drive. No matter how much you email and IM, you will never fully ‘get’ the person if you don’t at least talk on the phone. Once we have chatted, we usually work on filling in the online quote form. To sum up what has been discussed and to put down in writing the various aspects needed for this project. I don’t have a set price package so to speak. I feel it’s not for me to determine how much a client should place on the branding of their company. If their image is important to them then I would like to see this come voluntarily from them, rather than me suggesting a price. Only they can place a true value on their business. Often a client just has no idea on the value of design, how much it should cost. This is not to say they will be looking for the cheapest option. Far from it. In fact, they often just need some guidance, some explanations of the importance of a solid brand identity and also a explanation of what is really involved with a logo design project. Once you lay all this on the table, they are often happier to consider a higher budget. Fortunately for me, clients on average voluntarily put up anything between £750 – £2000 for a logo design project, this is without any interference from me, and this gives me a lot of hope in general. Not all clients are looking to get logo design on the cheap, in my experience over the last 6 months, quite the opposite. So this is encouraging for the industry and for any freelance logo designer. Here I will get a good idea on how a potential client perceives the value of design. I do consider lower price work if approached directly, there maybe a icon or simple badge to create opposed to a full blow logo design. But for simplicity, I keep my online form focused on the bigger picture. It is true that aligning your work with higher prices helps the client perceive you and your work in a certain way, opposed to a bargain basement approach. There are pro’s and con’s to both, but for me I have decided to focus on aligning my reputation and work at the middle/higher end. Some clients appreciate seeing higher prices as a sign of experience and quality. Some clients will just run a mile and find the cheapest designer they can get their hands on. But the work in your portfolio is the real focus, if they like your work but you are not the cheapest, you still stand a chance to secure them as a client. They want to feel they will know the type of work you will likely do for them and this will help them make that decision on how much to spend. After I have received the completed quote form, I will assess all the information and compare the work needed with their proposed budget. If the work required to complete a successful logo project is substantially more than the proposed budget, I will write back to the client and explain that their is a shortfall. In order to provide the client with logo based on their information they will ideally need to raise the budget. If this is a problem for them, either cash is limited or they just don’t want to pay what is needed, then we look at ways to reduce the time needed to complete the project. But this is not always easy to do. For me, I cant always justify spending unpaid hours on a project with a small budget. If there is still a deadlock with the budget, then I will take a view on a per project basis. I will not necessarily refuse the job, it may be a good job and client to have on board and I may accept I will have to spend more time than I am getting paid. This is ultimately my choice. If there is a massive discrepancy, or the client just seems to not value design or I get a sense it could lead to a somewhat challenging client designer relationship, then I will politely bow out. After any initial conversations on the phone or Skype, or regular email correspondence we will look to take the next step. Once I have the brief, a verbal acceptance on the budget, I will approach the subject of payment. This is a slightly sensitive issue, so I tread carefully here. It is clear on my quote form where I stand with regards to the deposit and full payment scenario. So hopefully, any clients still on board with me at this point are aware of my policy. But I still tread carefully. If the client is overseas I will send them a polite email gently reminding them that in their case I will require payment up front. I will explain my reasons for having this policy, that it’s a general rule and not personal. I finish the email by simply asking them if they have any concerns over this arrangement, rather than simply saying take it or leave it. I am always open to negotiation at this stage, but thankfully for me, every over seas client thus far has not had a problem with paying upfront. Assuming we have the all clear for payment up front then I will send a basic proposal detailing the work to be done, with contact information and a basic run down of a few key points. I cover cancellation, refunds, ownership of the artwork. The proposal is created in InDesign, a simple 2 page affair. Client and project information on one side, with costs and brief project outline. The reverse has the basic small print. Nothing complicated or lengthy to read. I don’t have a contract. To take action over a client who has done the dirty costs money, money that most freelancers don’t have. There are situations where a contract would make sense, but right now, I don’t I need one. Most of my clients are overseas, enforcing a contact for a overseas client, in times of dispute would be problematic, time consuming and expensive. They may give you peace of mind, but I think it’s a wasted peace of mind. As my business grows, and the type of identity work I take on increases in complexity, then I will re-visit the contract issue. My proposal form does contain the usual things such as cancellation, copyright, ownership. These I can explain in a small paragraph to avoid confusion that a heavy contract can give. Payment up front is my insurance. Now I have all peace of mind any freelancer can have by getting paid up front. I am able to rest easy, and totally focus on the job at hand without any of the low level anxiety we all face when it comes to invoicing at the project end. So assuming all the above points have been dealt with, I need to secure this client. I can’t rest easy until I see money in my hands. Presently, I keep this simple. Paypal or direct bank transfer, I still prefer Paypal. Even though the fee’s are a little high, the flexibility and near instant transactions with Paypal are worth it. I use Freshbooks to manage all my invoices, this means I can send personalized invoices, with a PayPal link via email. This makes it very quick and easy for a client to pay the deposit, assuming they have PayPal of course. The deposit needs to be received before I will seriously start working on a project, although it doesn’t stop me from thinking and tinkering around with a project before I have the deposit. This usually depends on if I have a good feeling about the client’s commitment to the project. Some time may have passed from the clients first contact to the point where you have sent the invoice. Some times it have been a number of weeks of communications and messaging. Some clients need quite a bit of reassurance, especially if they are investing upwards of £1000 in their identity, totally understandable. So I try not to rush them, although at the same time, I would like to get the deposit secured. So I do all I can to create an atmosphere of trust with them. Some ‘dead certain’ projects fall by the way side, this is normal. Can be frustrating, but you just wait for the next one to come along. Maybe you could look at how you conducted yourself, did you reply promptly? Did you communicate effectively? There are any number of reasons why a client may change their mind, some will just be down to their own personal or professional circumstances. Personally, I have had problems with time management and I know I have lost a few clients because of this. Once you realise your own faults, accept and acknowledge them, you can at least do something about it. I am far from being perfect, but I continually try hard to improve my service. Once you have the payment or deposit in your account, then you can at least breath a sigh of relief. I have recently started sending a PayPal receipt, acknowledging the payment. If you have sent someone money, it’s reassuring to know they received it, and of course it is useful for their own records. Now you can start the project. So this would be a good place to end this first part. Hope this gave you some insight into how I work my freelancing. Everyone has different methods, so this is by no means a ‘you should do it this way’. It’s also not exhaustive and comprehensive, although it’s pretty close. Part 2 will focus on my method of working from the research aspect, sketching and idea formulation and interactions with the client through-out the logo project. Sign up to my RSS feed to ensure you don’t miss Part 2.